Last Friday, I had to go to Berlin and I took the chance to visit the great AEG Turbine Factory, built by Peter Behrens from 1908 to 1909. It is a very important building that claims to be a big step into modern architecture. This very long hall with its concrete corners reforms the classic image of factory buildings made from brick, steel and glass from the turn of the centuries. Parts of gas turbines are still manufactured in it today, so still the same function is running the building was originally designed for. What could be better? After the drawing, I took along the river Spree in the direction of the inner city of Berlin. What was about to come? Just old cars, one by one! At first, I saw this Merecedes /8 (that's how we call it in Germany, the official name is W114). 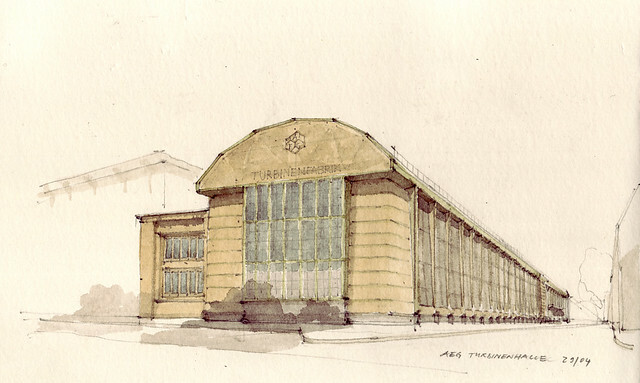 It reminded me on my Stuttgart time and I drew it. I just couldn't believe what I saw next. Two Citroen DS, just about 30 meters away from each other. The goddess of cars, the benchmark for nearly 20 years in upper class cars, a design made for a whole century. I took the black one for a drawing. On with the show! 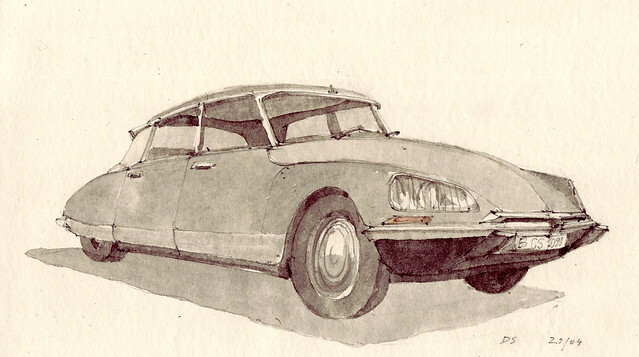 I could have drawn within the next 500 meters a Fiat 124 Spider, a Fiat 500, a Alfa Romeo GTA 1300 Junior, a Beetle Convertible and an old American Pick-Up which I could't identify. Unfortunately, time elapsed too fast and I had to carry on. 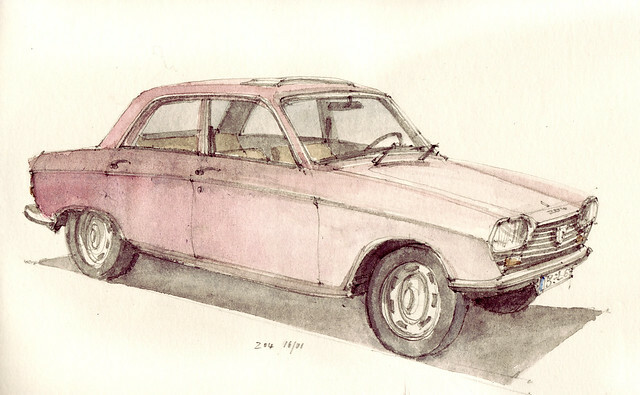 But here's another one from January, located in the heart of the city (near Friedrichstraße), a Peugeot 204 form the early 1970s in a bad condition, but still driven with daily by a student, who just went away when I finished the drawing. I have to return, that's for sure. That should be easy in the future, because Berlin is not very far from Cottbus, the town where I live. hi florian - schöne zeichnung von der aeg-halle. ich hatte einmal gelegenheit, sie von innen zu besichtigen (zeichnen streng verboten, geheime turbinen...), es war sehr beeindruckend, hightech turbinenpropeller in dieser doch schon recht patinierter halle mit toller tageslichtführung. danke für deinen kommentar. nette geschichte mit der aeg-halle. manchmal tauchen buch-bekannte gebäude einfach so auf, das habe ich auch schon erlebt. leider hatte ich nicht die gelegenheit, die halle von innen zu sehen, das wäre sicherlich spektakulär gesehen. die haben da einen pförtner sitzen, in dessen häuschen direkt so eine touri-ecke eingerichtet wurde mit dem hinweise, dass es absolut nicht möglich ist, die halle zu besichtigen, da eben der betrieb voll läuft (was ich aber wie schon erwähnt total gut finde). ich mag die DS auch sehr, endlich habe ich mal eine entdeckt, so dass ich sie zeichnen konnte. sitze gerade in münchen in der bib der tu und draußen steht ein blauer 911 targa von ca. 1971 und ein later ford taunus kombi... schaue schon sehnsüchtig nach draußen, aber eigentlich sollte ich was arbeiten ;) mal sehen, was der tag noch so bringt.